My Doctor Failed to Diagnose My Melanoma A dermatologist could have taken too small of a sample to diagnose melanoma or the sample could have been adequate and the pathologist failed to recognize it. Melanoma is a relatively rare but potentially fatal skin cancer. While skin cancers account for the vast majority of all cancers, melanoma makes up only about 2% of all skin cancers. The American Cancer Society estimates that in 2014 there will be approximately 76,000 melanoma cancers diagnosed of which about 10,000 will be fatal. Overall someone has about a 2% chance of being diagnosed with melanoma. Although the chances of melanoma increases with age, the average age of diagnosis is 61, it is not uncommon for someone to have the disease in their 30s. All too often once the cancer spreads from the initial site and effects lymph nodes, the brain, the lungs or other organs, it is fatal. Early detection and treatment is essential. 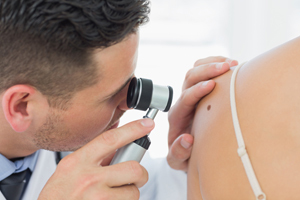 The American Cancer Society suggests that all of us should check our bodies thoroughly each month for unusual changes in moles, freckles, spots and other skin abnormalities. Anything that looks unusual or suspicious should be examined by a dermatologist. During the process of examination by dermatologist it is common for them to remove a sample of the suspicious spot to be examined under a microscope by a pathologist. This process is not without the opportunity for a medical mistake to be made. First the dermatologist must make a decision as to how likely they feel the spot is for being potentially melanoma. This may affect the type of sample they remove to be examined under a microscope. A mistake by the dermatologist in making that decision can result in an inadequate sample being taken and no diagnosis made and the biopsy being reported as being normal. Another problem may occur if the dermatologist does not remove enough tissue for an accurate diagnosis under the microscope by the pathologist. A pathologist is only able to report on what is seen on the tissue sample submitted to them for review. It is critical the sample taken be of the right size, depth, and area from the suspicious spot or lesion. The failure of the dermatologist to correctly remove the tissue for submission to the pathologist may be the basis for a medical malpractice claim. Another area of concern is the type of pathologist who examines the tissue sample submitted. Many dermatologist and other primary care physicians submit their tissue samples for microscopic examination to a pathology lab. They rely on the accuracy of that lab and on the individual pathologist. But there are two types of pathologists. A general pathologist reviews samples taken from many different types of physicians who submit tissue samples from all areas of the body. There also dermatologists who have received fellowship training in pathology who only review dermatology tissue samples. They are more highly trained in detecting melanoma than a general pathologist. A mistake in the chain of events in one or more the areas described above may result in a biopsy being reported as normal. All too often when this occurs there is a failure to diagnose the melanoma in time to prevent its spread. That may mean a cancer which was highly treatable may require highly invasive and disfiguring surgery, radiation or chemotherapy, or, sadly, may result in a terminal cancer.